Welcome to Custom Printed Lanyards UK | Personalised Lanyards Delivered Faster & Cheaper! 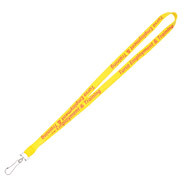 Our custom lanyards website is known in the UK marketplace for only quality printed lanyards. We have been operating for over 10 years and in that time have supplied millions of personalised lanyards to satisfied clients. One of the main advantages we have over other lanyard suppliers is that we own the lanyard factory that we produce from. We don’t go through agents or middle men when making our promotional lanyards. What this means to you is lanyards delivered faster and cheaper than anyone else in the United Kingdom.